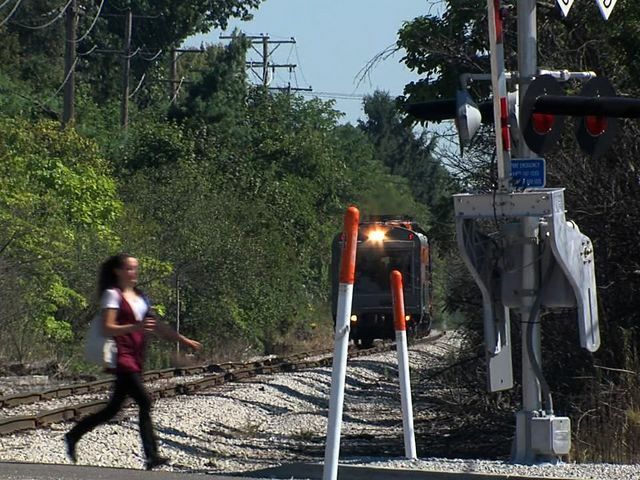 Several drivers, who hurried across railroad tracks in West Akron Wednesday afternoon, beat the train, but in return received tickets from police officers who were monitoring several crossings. Officers on motorcycles cited 22 drivers and two pedestrians who continued across the tracks after the red crossing lights started flashing. In some cases, cars accelerated over the tracks as the gates lowered. "You're supposed to stop when the red lights come on and it's almost four seconds before the gates come down," said Sgt. Doug Sandor. "You can't win in a crash with a train." The enforcement was part of Operation Lifesaver, a national program that Akron teams up with a few times a year. A two-car train from Wheeling and Lake Erie Railway went back and forth over a three-mile stretch for a couple of hours. Some of the drivers who violated the law were pulled over by officers and handed citations that could cost them up to $130. One of the drivers, Marilyn Lapides, was shaken up after receiving the ticket, but was also quick to point out a lesson can be learned. "I imagine it's a good thing. I don't know where my head was. I just was watching the people ahead of me and I didn't see the lights and then I found myself too close. You know you have to make a split second decision and so I just plowed through rather than getting hit," Lapides said. Statistics released by the Public Utilities Commission of Ohio show 29 vehicle versus train fatal crashes since 2012. In 2014, four people were killed at Ohio crossings, including a man in a wheelchair crossing the tracks on South Avenue in Akron. In 2015, nine fatalities have been reported at train crossings, including two in Grafton, one in Wellington and one in Huron. Nationally, 2,287 injuries and 269 deaths were reported at crossings, according to statistics from the Federal Railroad Administration.